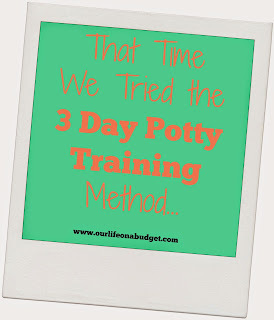 So... a couple weeks ago I wrote about how our 3 Day potty training experience was a total fail, but I knew BD could do it whenever she was ready. 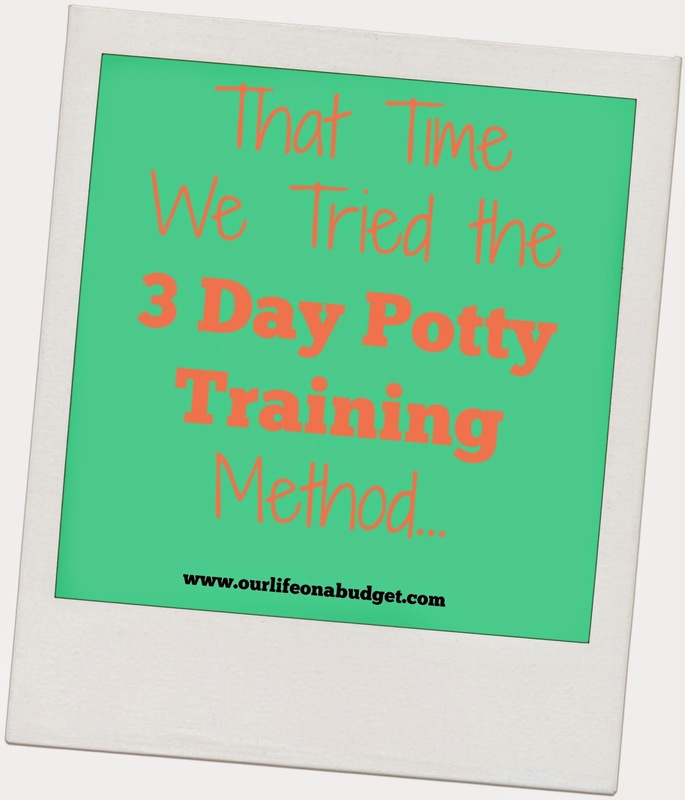 Well, right after I wrote that she decided it was time to be potty trained… and I am scared to say it but she seems to be 100% day trained and will even go when we are out and about! Night and nap are still in process, but that is okay. I wonder if we will have any regression when baby J comes around. I did manage to share our Baby Boy Nursery reveal (it was done and the pictures were already taken). 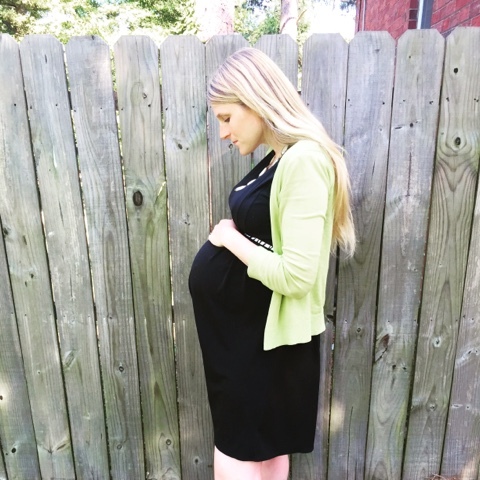 We are so excited about Jameson's little space, even though he will not care that much… on the contrary BD is pretty excited. Last Friday we of course took advantage of doughnut day. 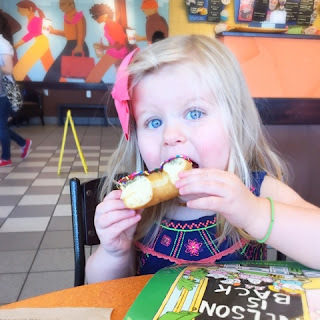 Free doughnuts always taste better… sorry Jameson for the sugar rush! *When she wakes up in the morning before me she gets out of bed silently and walks to wherever I am with her hair in her face so I can't see her eyes (think creepy, like the ring) and just stands there until I see her. 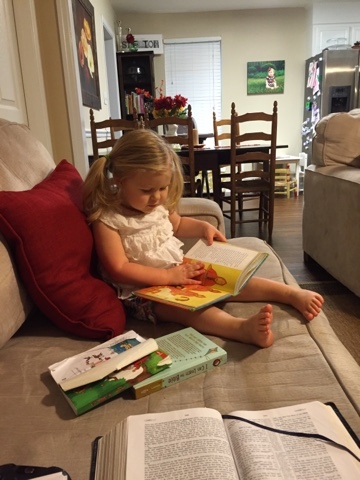 *Yesterday she woke up early so she said, "I study Bible with mommy" … day made. *She poses for pictures even when they are not being taken saying… "cheese." * Reads her books and I can actually hear her talking through the story! I SOOOOOO wish we could have a play date!!! They would have so much fun together! I know… you only hear the success stories of the three day method… but it does not always work!!! And this is such a fun age… we are soaking in every minute! I know… such a learning experience… I have had all the ideas about how everything should go and I have had to let it go and be flexible!!! Just life lived - and I love it. So much of our life is made up of these precious days. Thanks for sharing. Visiting from Raising Homemakers.